I am in the process of cleaning the entire house - top to bottom (or bottom to top) to donate, sell, gift, or toss anything that we aren't using....and organize what is left. Some of the hardest things to let go of are Goodwill purchases I made, but I am just not into anymore. Only 50% of what I buy is used or put onto display. About 25% is in storage, but I adore it...so these items are fulfilling a purpose! The final 25% is kicking around the house and has lost its luster. It feels like a complete waste of time and money to simply dump these items back at Goodwill**. I feel embarrassed just thinking about it. Then it is on to organizing. The drawers in the nursery make me happy every.single.time I open them. 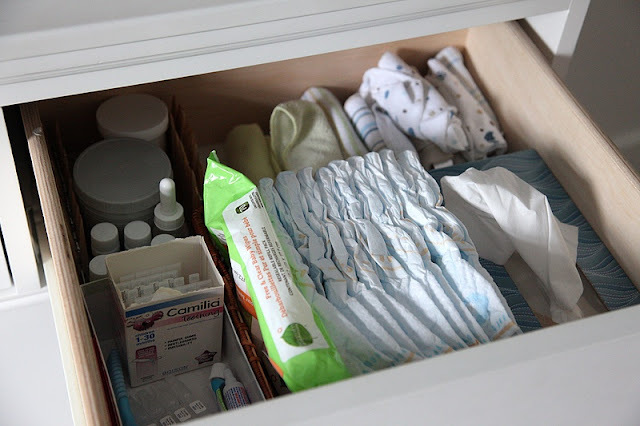 Diaper cream, diapers, hats, bibs, socks, all in second-hand baskets and repurposed cartons and boxes. Is it possible to make the entire contents of my house fit into pretty baskets and boxes? **I don't buy as much at the thrift stores as I once did. Love the purge and the organization! The house we have in Vancouver is half the size of our Toronto house (hurray for crazy real estate prices...) so I have to live quite lean. 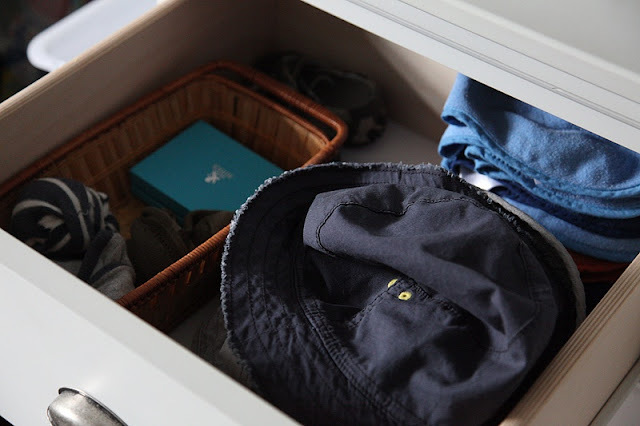 And get creative with storage. But spring is so perfect for the sorting and purging and going to Goodwill. Even my six year old daughter gets in on the action - nothing new comes in unless something else goes out. Sharon, if you are looking to downsize/sell any of your milk glass pls let us know - I'm totally interested. oh can you come over and help me? I did my front hall closet last week and I just love walking by it and opening it...makes me happy! You have inspired me. I truly have been biting my nails with an attitude, " I spent the money I should keep it"....time to let go..and make.it all organized. This is a great exercise! When I work with clients on organizing issues, this is one of the things people find hardest to do: prioritize which items are worth keeping and which they should let go of. I totally get it...we have our annual street sale on the long weekend and although we've participated in it the last 5 years, I STILL seem to have stuff to get rid of! I like your ditch test. I will keep that in mind as I go room to room, drawer to drawer! I'm really starting to hate the 'stuff'! I WANT TO DO THIS. It's settled, you've inspired me. I am going through this too! I am also just starting what looks to be a great book - the joy of less by francine jay. It took me a while to realize that even though I was pretty good about tossing stuff I wasn't using, I was terrible about not thinking critically enough about the stuff I was bringing in - and that stuff quickly became the stuff I was getting rid of. H&M and Value Village are the worst culprits for me... I am actually half-considering taking a photo of every piece of clothing I own and actually carrying around a little photo album in my purse. Yeah, I know - nuts. I don't want stuff to have any power over me! I would smile too looking at the drawers in your nursery! I just did a massive clean out of our basement and put up shelving in our storage area complete with clear boxes for everything. It was better than therapy! I liked your analogy realizing how little you actually need when you travel! Register on EverydayFamily TODAY and you will receive stage based pregnancy and baby email newsletters, offers and weekly coupons as well as access to free baby samples, coupons, baby magazines and more.